I’ve always been great at working out and I even lost 9 lbs this year to get at my target goal weight, but I still want to work harder towards implementing a healthier eating style. 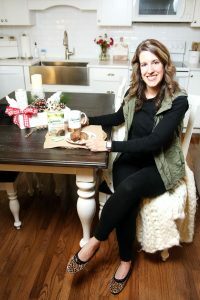 Today I’m sharing How I Plan to Implement a Healthier Eating Style with Splenda Naturals, Optimum Nutrition and Michelob ULTRA Pure Gold (available at Walmart) and I’m sharing a Delicious & Healthier Banana Bread Recipe. Plus, I’m offering a sweepstakes to help you stay on track with your fitness this year! Enter the Resolutions at Walmart Sweepstakes HERE for a chance to win a free gym membership! I’m the type of person that sticks to something I start and the further along I am in the journey, the more I want to continue it after receiving great results. YOU have to want to do something and to stay focused, or you’re just not going to stay on track and receive the results you want to see. I have become a morning person, so that I can get my workout in first thing in the morning before the rest of my family is awake. Then, I don’t have any excuses on why I didn’t complete it later in the day. By getting the workout done early, I won’t be distracted from it if one of the kids wakes up sick, or if I don’t have enough time or energy by the end of the day to complete it. You need to make exercise part of your day to day and you need to do some deep thinking about where you can fit it in consistently, so that you stay on track. Occasionally after working out, I’ll enjoy a little baked treat with coffee as a reward for all of my hard work. With Splenda Naturals Stevia, I can enjoy their great tasting 100% natural stevia product. I really enjoy baking this Healthier Banana Bread Recipe (see recipe below) with Splenda Naturals. Who would have thought that a healthier lifestyle could taste so sweet? 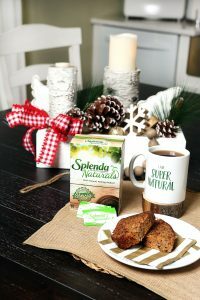 Splenda Naturals are 100% natural, great tasting (best tasting Stevia! ), no aftertaste, nothing artificial and zero calories. You just can’t beat that if you’re craving a little treat. Preheat oven to 325° F. Spray a 9×5 inch loaf pan with cooking spray. In a separate bowl, sift together flour, baking soda and salt. Add SPLENDA® Sweetener and stir into the banana mixture. Stir in pecans. Spread batter into prepared pan. I really enjoy using Optimum Nutrition products as a way to fuel my body and to keep it on track. Optimum Nutrition has a lot of great products, such as this Amino Energy. I use this for a quick pick me up at any time of the day. It’s so easy to prepare, just mix the powder with its refreshing fruit flavors into cold water and enjoy. I like that it has caffeine from natural sources for energy and focus support. Plus, each serving is only 5 calories with 0 grams of sugar! I guarantee it’s a lot healthier and cleaner than the coffee I drink (and all the goodies I’m tempted to add into it! ), which makes it a wonderful alternative! Another great product by Optimum Nutrition is their Gold Standard Whey. Sometimes you need to get a little more protein in your diet, especially if you try to implement a low carb day or two into your week or you eat mostly a plant based diet. 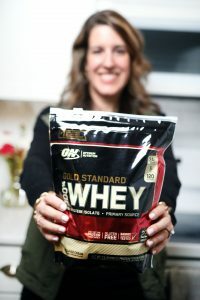 Gold Standard Whey offers you 24g of whey protein isolate as the primary source, which means many of the carbs and fat are isolated out or removed. 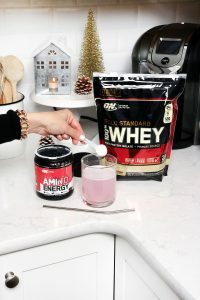 Gold Standard Whey is delicious and easy to mix with a glass and spoon. I usually mix it with cold water, but you can mix it into your favorite beverage. It’s only 120 calories 1.5g fat (or less) and 2g sugar (or less). Gold Standard Whey is gluten free. Sometimes I just need a little snack in-between meals or I need to get a little extra protein in for the day. 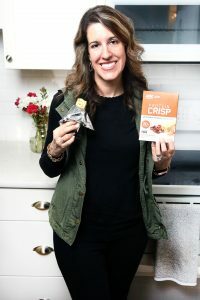 I love these Protein Crisp high protein bars with their delicious, crispy texture. Each bar provides 20g of protein, which is great if you need a little protein boost. I keep these in my bag, in our lazy susan in the kitchen and even in my gym bag. Now… sometimes you do need to indulge a little bit, especially if you’ve had a really good day or week with healthy eating habits. Now, Michelob ULTRA Pure Gold is the perfect answer if you want a drink, but don’t want to sacrifice the day’s hard work. 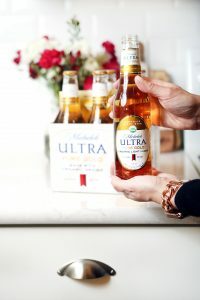 Michelob ULTRA Pure Gold is made with organic grains for a pure and refreshing taste. It has only 2.5 carbs and is only 85 calories and is triple filtered and brewed free of artificial colors and flavors. I can attest in the photo above that Michelob ULTRA Pure Gold is a light lager with a superior golden taste. 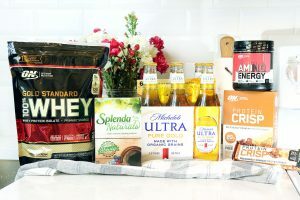 Now, you can grab these great products at Walmart, including Splenda, Michelob Ultra and Optimum Nutrition! Be sure to enjoy Michelob ULTRA Pure Gold responsibly. Plan out what you’re going to eat the night before, so that you stay on track the entire day. I also enjoy doing two days of low carb and then I’ll do several regular macro days. The low carb days give my body a little rest from all of the carbs, but then I can refuel it with the carbs it needs later in the week when I do the regular macro days. Following a plant based diet can be really beneficial, all of these foods are packed with the nutrients your body craves and needs. Pick 1-2 foods and implement them into your diet EVERY day. I try to eat 1-2 bananas every single day and I also sneak in sweet potatoes when I can. Stay away from packaged products, shop the outer perimeter of the store. Make it a goal to drink only water Monday-Friday and then add in some other drinks on the weekends. I hope you enjoyed reading about all of my tips and tricks on staying focused on healthier eating and why it is so, so worth it! Don’t forget to enter the sweepstakes HERE to win a free gym membership this year! You can follow Optimum Nutrition on Facebook, Instagram and Twitter. You can follow Splenda on Facebook, Instagram, Twitter or their Landing Page.